I have known for a little while that my guru, Joel Hays, was about to take the final plunge into the riptide of parenthood, and hang up his red-mud-stained flats boots. That day finally came today. Joel is my drug dealer, and it seems like only yesterday he dealt me the addiction to fly fishing. His depth of knowledge, from the Colorado high mountain small streams, down to the steaming flats of summer at Ray Roberts, all were part of his repertoire. And I still get some new nugget every time we talk fly fishing, and all that information and knowledge will continue to be used on into the future. Don’t get me wrong; Joel would talk me into bad things too, like this new obsession he has with me owning a flats boat of some kind – supposedly for poling clients in freshwater shallows for carp. It sounds romantic as hell, but I found the perfect woman and I want to keep her. 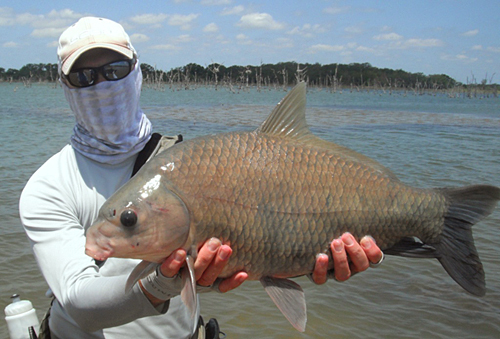 There may be something of a vacuum as one prominent flats carp guide takes an extended breather to raise a couple of fantastic boys, but I’m here to tell you, fifteen years goes by in the blink of an eye. Caps off, a clink of the steins, and down one of Joel’s favorite brews, all to say THANK YOU from me, and those of us you have shared your knowledge and passion in this world of fly fishing. Just look what you’ve done! You can read Joel’s post by going to www.dfwflyfishing.com, and comments are appreciated. And if you see a guy on this site, from time to time, with a BUFF to hide his face, it’s a pretty safe guess as to his real identity.